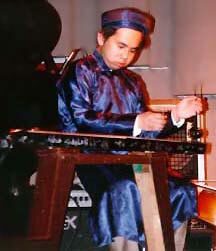 Bui Huu Nhut (pronounced "buoy who newt") is a leading performer on the dan bau, an instrument of purely Vietnamese origin. Its single string is stretched over a long box, attached to a tuning peg at one end, and to a flexible rod (which holds a resonating gourd) at the other. Its sound is said to "find its way into the secret places of the soul." A native of Saigon, Mr. Bui has lived in the U.S. since 1989. He performs in traditional Vietnamese groups and with several ensemble variations of Ancient Future, including the Asian Fusion Dance Ensemble Program. Ja Nam (Matthew Montfort 3:53). >YTmusic. "Ja Nam" is Matthew Montfort's reggae version of the Vietnamese folk standard "Ly Chim Quyen" (Song of the Nightingale). The song features Bui Huu Nhut playing the dan bau, and appears on both Asian Lounge, a Putumayo sampler, and Asian Fusion by Ancient Future. Asian Fusion (Narada Equinox ND-63023) CD-24.98 (out of print: collectable signed reconditioned copy): Add 1 to Cart. Buy 1 Now. Asian Lounge (Putumayo 244-2) CD-$15.98: Add 1 to Cart. Buy 1 Now.